Artichokes are kind of ridiculous. Hard to prep, hard to clean, and even hard to eat. I mean, they’re thistles, humans probably shouldn’t be eating them at all. Most of the year, I am content with eating artichoke hearts from jars or freezer bags or minced up in dip, but about once every spring I get itchy for the real thing. So I go to the store, pick out a few deceptively pretty bulbs and inevitably stab myself in the process. Then I drop them into one of those flimsy produce bags because I forgot my reusable ones and one of the thorns almost rips the bag open as I’m twisting it shut. They go in the cart, gingerly. At home, I stab myself again on the thorns as I’m trying to wrestle the tops off with my sharpest vegetable cleaver. I forget to prepare a bowl of lemon water until at least two of my artichokes are hopelessly brown. Peel the veiny bits from the stems, snip off the thorns that can’t be reasonably reached by the cleaver one by one, hack each choke in half, and scrape out the furry bits with a spoon. Every bit of this process is obnoxious, but I think it makes conquering them a bit more satisfying. I like mine twice cooked, once with water either in a steamer basket or just the bottom of a microwavable bowl covered in wrap until they are tender, and once with a dab of oil and a hot grill pan for some extra flavor. Then it’s all about dismantling, with some kind of flavorful dip (garlic lemon aioli for me) and savoring that hard-won tender heart. Scratch the itch and I’m good for another year. 1. 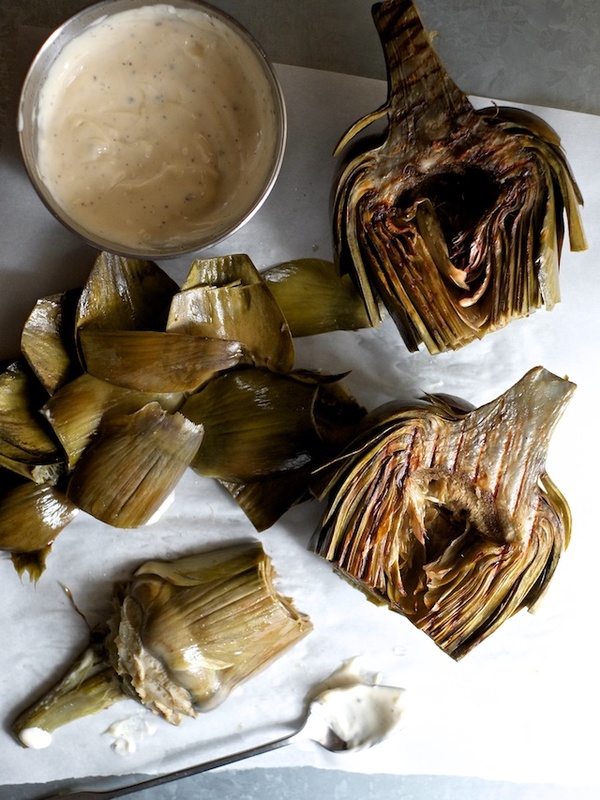 Start by prepping your artichokes. 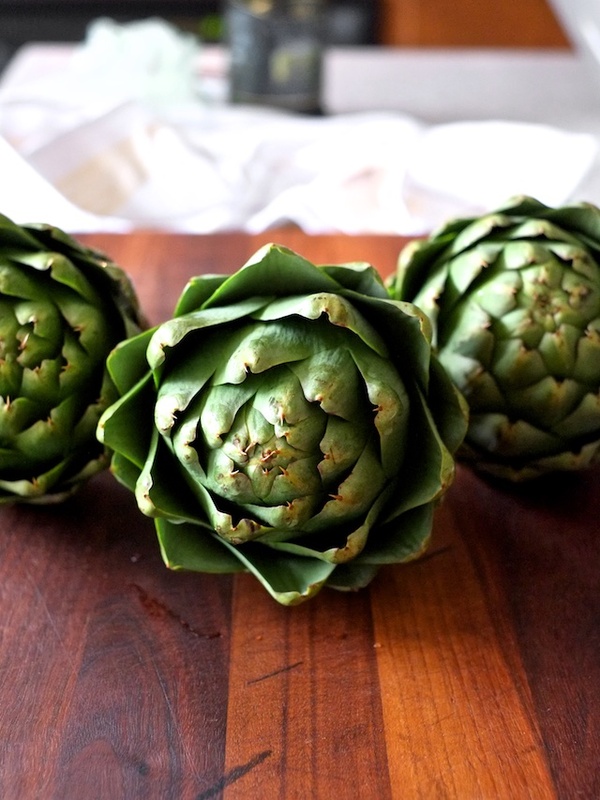 Get a large bowl of water ready with the juice of 1/2 lemon to stop the artichokes from browning once they are cut. Then trim the stems and peel away any fibrous stringy bits with a vegetable peeler. 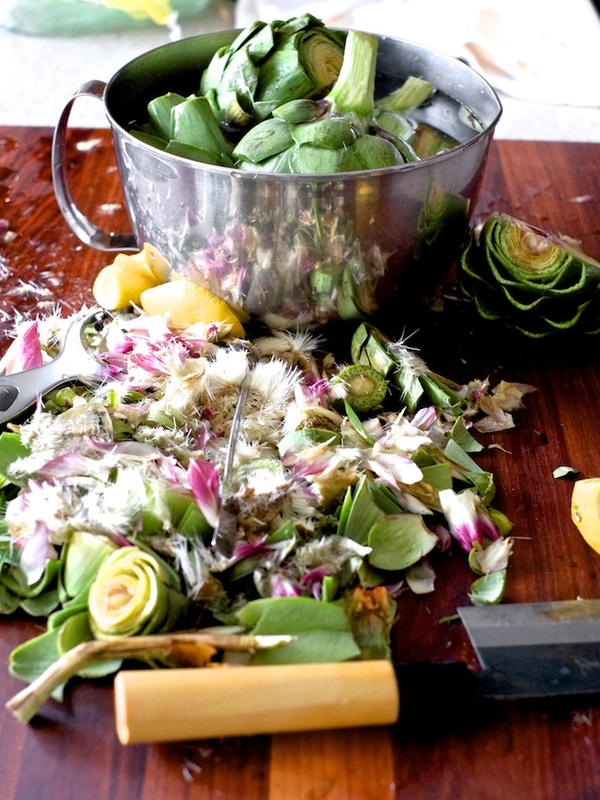 Using your sharpest knife, cut off the tops of the artichokes where most of the thorns are. Then use kitchen scissors to trim the thorns off of the leaves on the outside of each artichoke. Use your knife to cut each artichoke in half and use a spoon to scrape out all of the fuzz above the heart. 2. After scraping the fuzzy bits out of the artichoke halves, drop them in your prepared lemon water. Work your fingers between the leaves to clean out any dirt that may be hiding. 3. 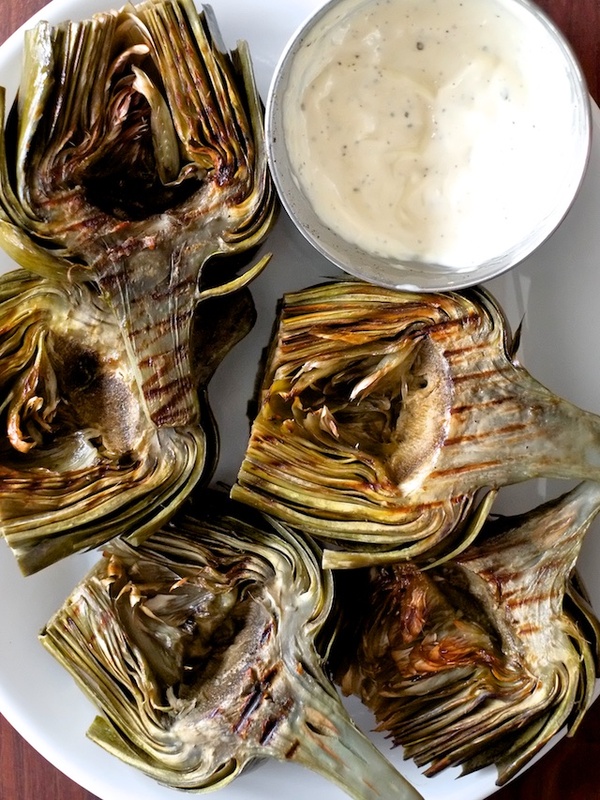 Steam your artichokes in a pot with a steamer basket for 30-45 minutes or in a large, microwave-safe bowl with a bit of water in the bottom for 10-15 minutes or until tender (test for tenderness with a small knife inserted at the base of the artichoke). 4. 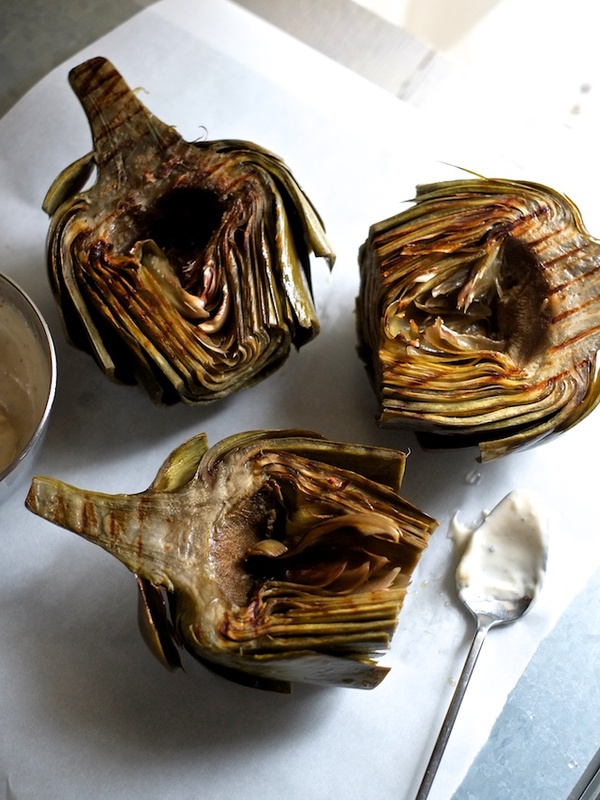 Remove artichokes from steamer bowl or pot, drizzle with olive oil, and sprinkle with salt. Grill cut-side down on a grill pan set over high heat or on an outdoor grill over medium heat until the artichokes are nicely marked. 5. Make your aioli by stirring together mayo, garlic, lemon, salt, and pepper. Adjust seasoning to taste and serve with the artichokes.